Daniil Kvyat set the fastest time of testing so far to top the time sheets on day three of testing in Barcelona. The Russian managed to stop Ferrari going fastest for a third day running, setting a 1m17.704s in his Toro Rosso towards the end of the session. It was impressive pace from the Honda-powered team, with Daniil Kvyat setting his time on the softest C5 tyre compound. Kimi Raikkonen was marginally slower in his Alfa Romeo, who set his time on the same compound of tyre just before the lunch break. It was a good time from the Ferrari-powered team, who will not bear the Sauber name this season. Following Daniel Ricciardo’s rear wing failure on day two of testing, the Australian was able to put his Renault in third towards the end of the day, setting his best time on the C4 softer tyre compound. Renault had opted not to use DRS throughout the morning as a result of the failure, although was later used in the afternoon. Nico Hulkenberg managed to put his Renault sixth fastest for the third day of testing, also setting his time on the softer C4 tyre compound. Sebastian Vettel ended the day fourth quickest, although the German set his best time using the harder C3 compound tyres on his Ferrari, setting a time two tenths slower than his best on Monday. 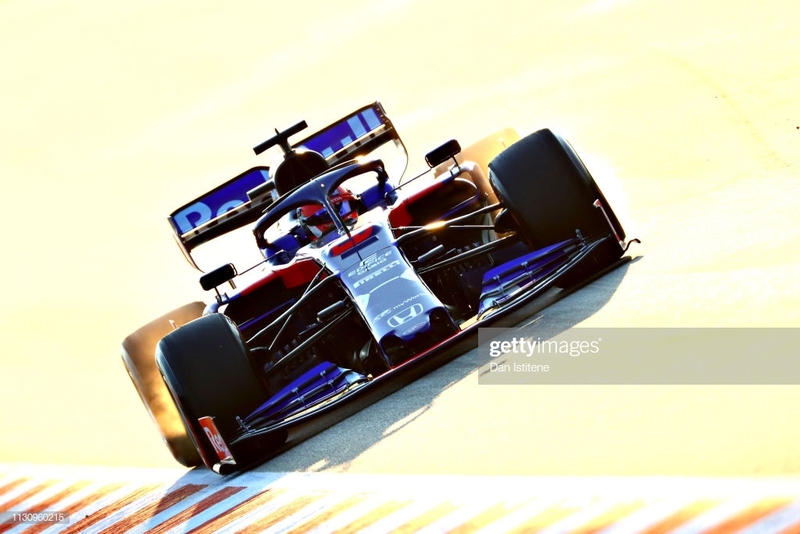 Max Verstappen managed to go fifth fastest in his Red Bull, showing good form in the new Honda-powered car, whilst Haas driver Romain Grosjean ended the day in seventh. Haas test driver Pietro Fittipaldi, who also drove the new VF-19 on Tuesday, caused a red flag during the morning after his car stopped on circuit, although managed to end the day just behind Grosjean in eight. Despite impressive times from McLaren on the first two days of testing, Carlos Sainz could only go ninth fastest for the team after missing two hours of testing in the morning. The team did not have an incident-free day either, with an aerodynamic piece falling off the Spaniard’s car which sent him into the gravel. Racing Point driver Sergio Perez was also down the order, ending the day tenth fastest behind McLaren. Like the previous two days of testing, reigning world champions Mercedes remained absent from the top of the timesheets, with Valtteri Bottas ending the day 11th and Lewis Hamilton behind in 12th, setting a time within two-tenths of each other on the C3 tyre compound. After missing the first two days of testing, Williams were able to give their new FW42 some track time during the afternoon with George Russell. Following delays in getting the car ready in time for testing, the team’s new signing was able put some mileage on the car, with the Grove team looking to make up for lost time. However, the team ended the session slowest, nearly eight seconds off the pace set by Kvyat.